In Retinitis pigmentosa (RP), progressive photoreceptor degeneration leading to blindness occurs through an active form of cell death known as apoptosis. This word, derided from Greek and referring to the process of tree foliage, is a complex mechanism, implicating a number of biochemical reactions, precisely controlled by the cell. Using the retinal degeneration 10 (rd10) mouse model of RP, a group of Italian investigators leaded by Enrica Strettoi, from the Italian National Research Council (CNR) and Riccardo Ghidoni, from the University of Milan, investigated the role of ceramide, a lipid molecule used by cells as a pro-apoptotic messenger, in retinal degeneration. The group of investigators tested the possibility that photoreceptor loss could be slowed or blocked by interfering with the ceramide signaling pathway of apoptosis in vivo. The experiments lead to the finding that retinal ceramide levels increased in rd10 mice during the period of maximum photoreceptor death. Moreover, single intraocular injections of myriocin, a powerful inhibitor of the rate limiting enzyme of ceramide biosynthesis, lowered retinal ceramide levels to normal values and rescued photoreceptors from apoptotic death. Noninvasive and long term treatment was achieved using eye drops consisting of a suspension of solid lipid nanoparticles loaded with myriocin. Such noninvasive treatment lowered retinal ceramide in a manner similar to intraocular injections, indicating that nanoparticles functioned as a vector permitting trans-ocular drug administration. Prolonged treatment (over 20 days) with solid lipid nanoparticles increased photoreceptor survival, preserved photoreceptor morphology, and extended the ability of the retina to respond to light as assessed by electroretinography. In conclusion, pharmacological targeting of ceramide biosynthesis slowed the progression of RP in a mouse model, and therefore may represent a therapeutic approach to treating this disease in humans. Trans-ocular administration of drugs carried in solid lipid nanoparticles, as experimented in this study, may facilitate continuous, noninvasive treatment of patients with RP and other retinal pathologies. The study was published in the Neurobiology section of PNAS and was co-authored by Claudia Gargini, from the University of Pisa, and Paolo Gasco, from Nanovector, the Turin-based biotech who patented the nanoparticles used for delivery. Young investigators participated to the study. The research project was co-funded by the British Retintis Pigmentosa Society. A. 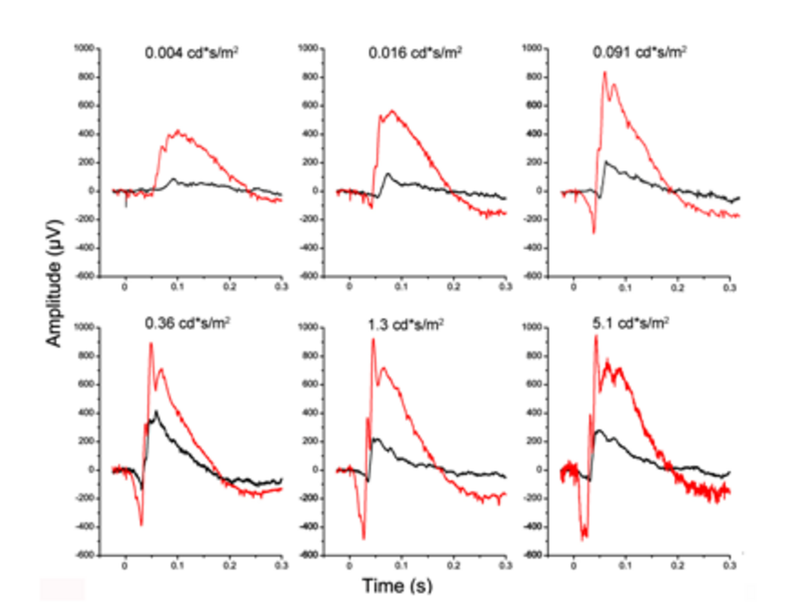 Time course of endogenous ceramide content in retinas of mice pups during the 1st month of life: in rd10 mice, ceramide levels begin to increase during the 3rd week of life, in concomitance with retinal degeneration. Values are mean and SE of 3-5 retinas per data point. * p=0.050; ** p=0.001, t test. B. Effect of intraocular myriocin injection on retinal ceramide content in rd10 mice. Right eyes were injected on P19 with a single dose of myriocin; left eyes were treated with vehicle. Ceramide content was assessed on P21. Animals are shown in order of increasing ceramide content in myriocin-treated retinas. In 14 of 16 animals, myriocin lowered ceramide content; p=0.030, paired t test. Figure 2. Intraocular myriocin injection slows photoreceptor loss. A, B. Fluorescence microscopy of retina whole mounts, fixed and stained with ethidium homodimer, from mice treated with vehicle (A) or myriocin (B) on P19: myriocin injection was associated with a reduction in the number of pycnotic photoreceptor nuclei on P21. C. Quantification of pycnotic nuclei per retina. Values are mean (SE) of 16 mice. ** p=0.007, t test. Figure 3. Effects of myriocin-SLNs on ERG. 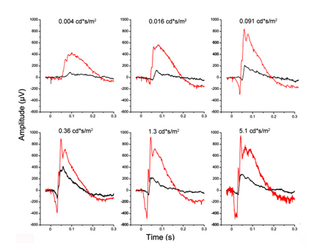 The best examples of ERG responses to flashes of light of increasing intensity from two rd10 mice aged P24. Traces in the panel corresponding to the lowest light intensity are purely rod-driven, while the others represent mixed rod-cone responses. Red traces: responses from a mouse treated with myriocin-SLNs; black traces: responses from a mouse treated with control SLNs. In this instance, the SLNs contained the highest myriocin concentration (1 mM) of this study. Strettoi E, Gargini C, Novelli E, Sala G, Piano I, Gasco P, Ghidoni R.
"Inhibition of ceramide biosynthesis preserves photoreceptor structure and function in a mouse model of retinitis pigmentosa." Proc Natl Acad Sci U S A. 2010Oct 11. [Epub ahead of print] PubMed PMID: 20937879.